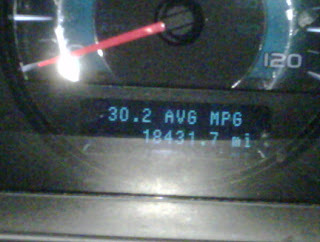 5 MPG represents a 20% increase! With gas costs up over $3.50/gallon, 20% savings is major. This is one goal that will push my resolve. I do not like driving this way. I'll let you know if I can keep it up. I plan on posting a favorite video each Sunday to kick off our worship. Enjoy the Lord today. This year, I am working on my personal discipline. I struggle to finish things, and to keep consistent on just about anything. Its a part of my character that I would like to refine. So I have started working on various goals, and set them for two weeks. At the beginning of the year, I was a vegetarian for two weeks. That launched a change in how the family has been eating. I am not continuing that goal because I feel no need to, but it was nice to complete my first two week goal. Blogging is one as well that I hope to continue well past the two week mark. Look for posts labeled "Personal goals" for updates on how I am doing. On Monday we will be shipping the lion's share of the project I have been working on for the last few months. I am technically under an NDA, but I figure if they are giving this out, so can I. Visit EPRI's website and download this little article. Its a pretty neat process, and will ultimately save you money on your power bill (at least that's the theory). Recently, we were involved in a project were a simple Lead/Lag controller was started up by the mechanical contractor. During the install there were a few items where the commissioning agent requested some changes to the programming of our controller. Since the job is local, I ended up going on site to install the new program and provide some courtesy training. As I watched the system work, it did not “feel” right. The outlet of the hot water boilers was around 190°F but the system loop was stuck well below setpoint. The boilers were cut back on their high limits, but the water was never making it to the main supply sensor. I found myself walking around the boiler room staring at the ceiling, tracing the piping in my mind. It all looked right. The offline boilers recirculate into the boiler loop. The online boilers go to the secondary loop. There is a way for it to cross over which I assumed was where the temperature was dropping, but I mentioned on both occasions to the mechanical contractor to check the flow, because there was definitely flow problems. Like most contractors, he was simply happy to be getting off the job. After the building was handed over to the end user, their chief operator called asking for help. He saw that there was a problem. When an event happened that cause instability (boiler fault, large change in load, etc.) the system would lose control and never really recover. He was prepared to rip the controls off the wall. Of course this was a controls problem. I asked our VP of Service to go to the job. I knew there was something wrong, but I did not see it. I explained the flow problems that I had noticed and asked him to keep an eye out. Once on site, Darrel started examining the install like I did. What my untrained eyes missed, his saw. The isolation valves were wired correctly in our panel, but went through relays which were wired inverted. The offline boilers were actually piped into the header, while the online boilers were recirculating. Presumably, heated water was flowing back to the boiler loop, then out through the offline boilers. It was very satisfying personally to return to the site and see the temperatures working as they should. Everyone involved, the installer, mechanical contractor, commissioning agent, the end user and I missed this. Once fixed, the controller worked well. It is easy to assume the controls are at fault. They are often the least understood, and therefore bear the brunt of the blame. However in times like these, the controls are simply responding to some other mechanical error. Not every problem is caused, nor can be fixed by controls. Here is an interesting article about Borders, books, publishing, and doing business in today's economy. Our storage room is prone to disaster. The one thing you want is buried in the back, and once you have destroyed the room, putting it back is just too much trouble. We normally take an evening and rectify that room a couple times a year. Since I was off on Monday, I decided to tackle the room and add some shelving to help in the future. I cleared out the area and built this shelf. For $100 at home depot, this shelf is nice. We have some particle board shelves. and the sagging always bothers me. These are rated for 600lbs each (3600lbs total for 6 shelves). Shelf liners are a must with these wire shelves. One think that always seems to get in the way is wrapping paper, so I built this little rig to hold it. Veronica made fun of it, but I figure she will be happy when the wrapping paper stays nice. Plus it is built Dad Evans style, so its not going anywhere. This is great! I cannot stop watching. I just finished rereading George Orwell's 1984. I am fascinated at this book's ability to go from excitement and hope to utter despair in an instant. Of course stories that do not end well frustrate me (like Message in a Bottle), but of course the main message of the book is a social and political one. It is ashame that today's government is often called Big Brother because it really minimizes the point of Big Brother in the story. A few weeks ago we were discussing this book with a young professional (early 20's) who had never read it. He was only familiar with the term Big Brother in reference to our police-state mentality, but Big Brother is so much more than that. There is a part of the book where Winston is reading the contra-band book written by Goldstein where Orwell lays out some interesting notions which I ended up pondering a lot. In simple terms, the statement is made that machines could eliminate scarcity, but scarcity is required for hierarchical society, so war is needed to consume additional resources to keep scarcity a reality. What is interesting to me is that while we have advanced to the point of amazing machinery capable of performing many tasks, and reducing costs for complex problems, we have failed at eliminating scarcity. Instead we have grown our personal need for more and better things requiring more resources. Instead of Orwell's war solution, our own personal greed is keeping us in a scarce society. It is unfortunate that we live this way. I am guilty. I long for the latest TV, tablet, dishes, cars, food, etc. while my fellow man starves on the other side of a shrinking planet. Morally, I wonder if Jesus would see eliminating scarcity as a positive for society? Is that what we as the Church of Jesus should be striving for? Is it even an attainable goal, or is man's morality so broken that any advances made to lower scarcity will be swallowed back into making the wealthy more so? These are the questions that have been plaguing me recently. If you have never read 1984, and you are of age, go read it. It is a fascinating book about human sociology, politics and freedom. I am stepping up my blogging. Initial goal: two weeks straight, but hope for more.